First Sunday in Advent and I suppose I should be hanging up the Christmas curtains, taking out the advent candles and putting some decorations around the house. Truth be told, after a long night with too much festivity in that bottle of wine, or maybe it was the aquavit…I am too lazy to do anything. Just the thought of digging in that hole (where we keep a thousand things,) to find anything having to do with Christmas wears me out. 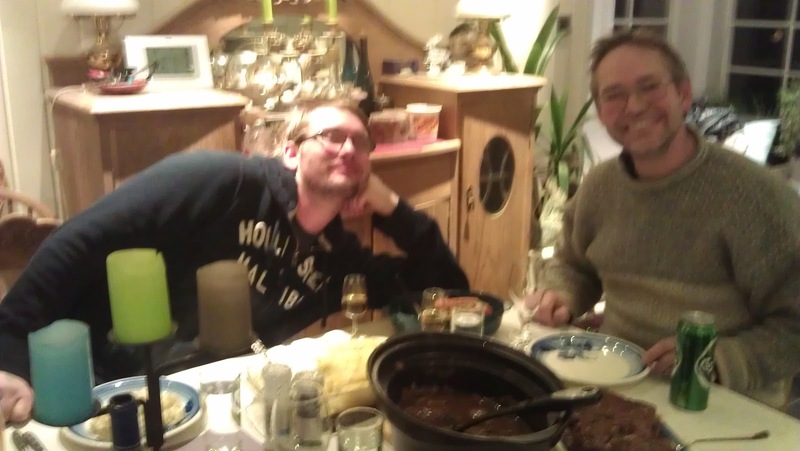 Last night my youngest son came over for Mom’s pot roast and Dad’s newly acquired Christmas Aquavit. Just so you know that is a Norwegian tradition not to be messed with! So what am I doing today? NOTHING! and more of the same. It is already dark outside and the time is 4pm so what I feel like doing the most is crawling back into bed with a good book. So how are you spending this first sunday of advent? Have you already started celebrating christmas too? I don't feel I've achieved much this weekend, certainly not everything on 'my list' but I have done a little shopping and watched 'Miracle on 34th Street' this afternoon - a lovely Christmassy movie! Now enjoying a glass of wine while the roast cooks so not all bad! You are too funny Sis. I still have Thanksgiving decorations up ... I is now going into Dec. 7th. Sunday... Went downtown to an AMAZING kid's concert featuring classical and asian music. My jaw dropped when a SEVEN-YEAR-OLD skipped up to the piano and played a ten minute piece from CHOPIN.... I nearly FELL off my seat. AMAZING. I had never witnessed a child prodigy in person before... I will NEVER forget it. SHe had to be MOZART reincarnated. OH, I am with you about the city going dark at four o'clock... Here in Chicago it get dark about fifteen minutes later than Norway. Hate it!